Every spring, Torontonians declare war on raccoon nation. Raccoons are pests that can be found roaming streets, climbing trees and rummaging through our garbage, creating messes that we need to clean up. Just last spring, the City of Toronto was looking to take on the pests with a new generation of green bins specially designed to keep the animals away. The green bins would be equipped with a “twist-type lock” on the top, making it more difficult for racoons to climb in. But yesterday, Torontonians put away their animosity and showed sympathy for a raccoon that expired on the sidewalk at Yonge and Church Streets. The first tweet about the dead raccoon was posted onto Twitter at around 9am. 311, Animal Services, provided a quick response, stating that they were already notified. Although they promised a quick response, a quick response far from what Canadians received, sparking outrage on social media. As the day turning to night, the raccoon remained on its back and on the sidewalk. 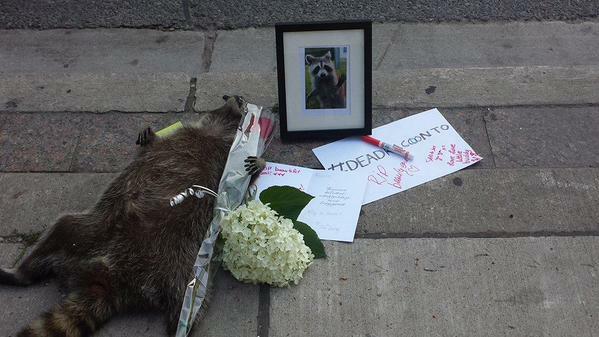 This prompted people to make a makeshift memorial and dubbed the furry animal “Conrad” using the hashtag #DeadRaccoonTo. Someone even added a donation box beside the dead raccoon (whatever happened to it?). 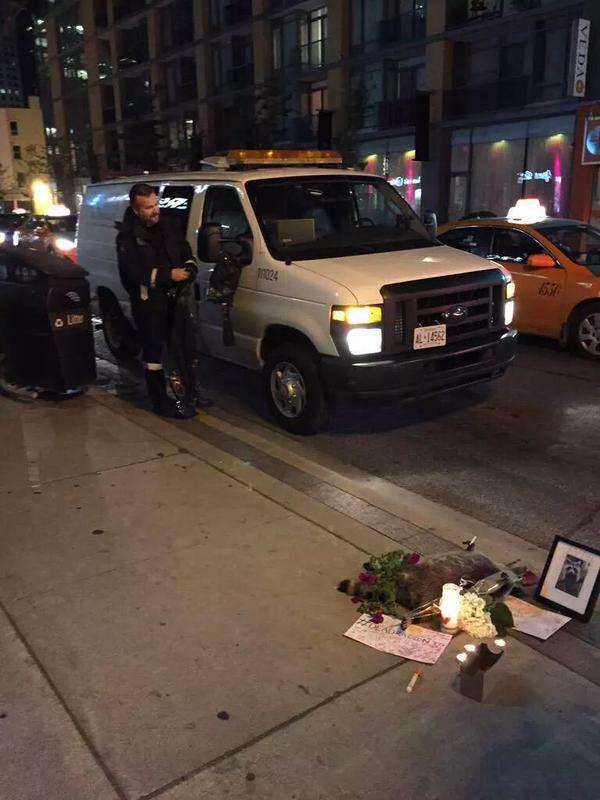 Flowers and notes continued to pile up more than 12 hours after the initial post and even city councillor Norm Kelly chimed in with several tweets urging the city to remove the raccoon. He even encouraged Torontonians to keep their garbage bins open in honour of the fallen enemy. Finally at around 11 p.m. E.S.T., it was announced via Twitter by Norm Kelly that the raccoon was picked up; 14 hours after first report. Do you think that Animal Control services purposely left the raccoon on the sidewalk to see how far Torontonians would go? Weight in on this debate in the forum section of this blog post. One thing is clear, social media is always there to provide anyone with the platform and voice for concerns. All it took was for one person to tweet their concerns and for the rest to agree with them.